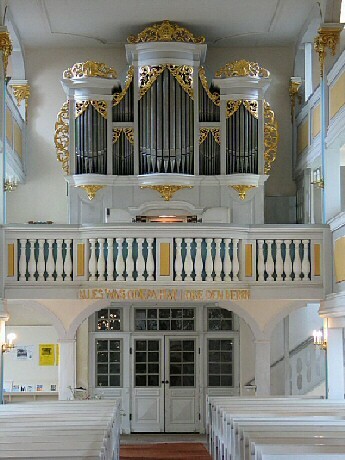 1731 Gottfried Silbermann organ of Reinhardtsgrimma/Saxony, 15 years after the first HW1-release (one of the first instruments for Hauptwerk ever). This instrument has the typical uniform Gottfried Silbermann disposition of a medium sized village church organ with two manuals, pedal and 20 stops without reed stops in the manuals. Typical G. Silbermann organ characteristics are full and warm 8' Principals, bright super-octave registers 4', 2' and 1', strong and sharp aliquots such as 1 1/2 'and 3', characteristic expressive registers are Rohrflöte 8', Quintadena 8' and Spitzflöte 4'. The octave-accented Plenum sound is extremely powerful and triumphant. The instrument, restored in 1997 by the Silbermann specialist Kristian Wegscheider / Dresden, is today considered one of the most appreciated instruments of this type. The church of Reinhardtsgrimma has a maximum reverberation time of 2 seconds and thus creates a great clarity for polyphonic lines. Helmut Walcha loved this instrument. Due to its relatively dry acoustics and the expandable manual and pedal compasses, the set is also excellently suited as an exercise instrument. The entire Bach work can be played on it. 48 kHz, 24 bit, multi-channel for Surround/Vario Audio Perspective (VAP), The stops were recorded with multiple release levels for short, medium and long key attacks for optimal acoustical mapping. All ranks were additionally recorded with the original tremulant sound. We would be happy to receive your order again! ATTENTION: The OAM office is vacant from May 4th to May 22nd. Your orders will be accepted and shipping will take place in week 21/22. Wonderful news Prof Maier - thank you for taking the time to update this sampleset and so ensure that this lovely Silbermann is available in the best sound quality that today's technology can achieve. It shows how much you are dedicated to the aims of your project that you are prepared to do this when you would certainly have made more money by sampling something new for the first time. I have been loving listening to the examples on CB of this updated gem. It is my sincerest dream that you would one day do the same for Vollenhove which I play every day and is easily my (and other people's) favourite of all Hauptwerk organs to practise on. Congratulations on the release of this fine-sounding instrument. Thanks for this fine compliment! Yes, the work on the Walcker organ really would have priority, but due to a lot of enquiries I felt, such smaller gems like the Silbermann and Ortega (sleeping some years in alpha state to be awakened) deserved now to be released before continuing this bigger work. The Vollenhove already was recorded with the same technique as Reinhardtsgrimma (also 6-channel recording), only the native Tremulants were missing at this time (and perhaps Surround/VAP). The introductory price is valid for one week until May 28th. This is a great sample set of an a wonderful instrument. You play for a long period on just one (or a few stops) without getting tired of the sound. As noted above the reverberation in the church is only about 2 seconds. These two factors make this a great practice instrument as well as a fine instrument for performing contrapuntal and other appropriate music. The sample set is efficient in its use of memory and uses less than 6GB when loaded with lossless compression at 24-bit resolution.